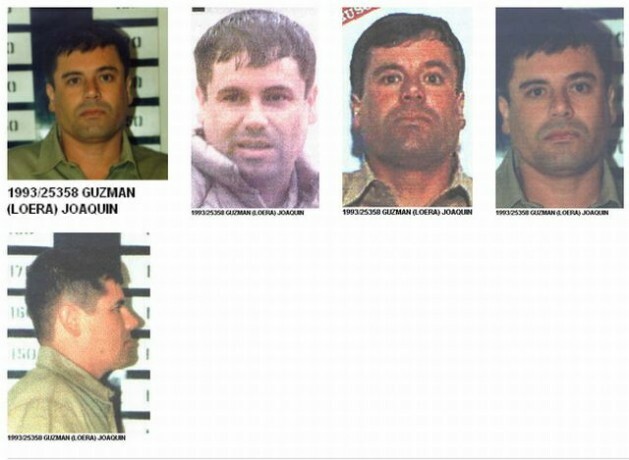 Photographs of Joaquín Guzmán, alias "El Chapo", on Interpol's web page. MEXICO CITY, Feb 25 2014 (IPS) - The arrest of the head of the Sinaloa drug cartel, Joaquín “El Chapo” Guzmán, will not affect drug trafficking in Mexico, but it presents an opportunity to change the country’s drug policy, experts told IPS. The organisational hierarchy of the Sinaloa cartel “reflects the weakness of the Mexican state,” said Edgardo Buscaglia, head of the Instituto de Acción Ciudadana para la Justicia y la Democracia (Institute for Citizen Action for Justice and Democracy), an NGO. Guzmán, the world’s most wanted drug trafficker until his capture in the early hours of Saturday Feb. 22, had his centre of operations in the northwestern Mexican state of Sinaloa. In Buscaglia’s view, the two previous governments of the rightwing National Action Party (PAN) “only dismantled networked power groups, without replacing them” with an adequate state presence. To achieve that, it is necessary to “audit the assets” of the business and political network that allowed the expansion of the Sinaloa cartel in the first place, Buscaglia said. The Sinaloa cartel is the most powerful in Mexico, and competes with at least seven other trafficking organisations for the production, transport and smuggling of illegal drugs to the lucrative U.S. market. Mexican marines arrested the 56-year-old Guzmán in an apartment building in the tourist port city of Mazatlán, thanks to information shared by the U.S. Drug Enforcemant Administration (DEA). Guzmán had been captured previously in Guatemala in 1993, but after his extradition and incarceration in a high-security prison in the western Mexican state of Jalisco, he escaped in January 2001, during the government of president Vicente Fox (2000-2006). Since then Guzmán, with the support of Ismael “El Mayo” Zambada and Juan José “El Azul” Esparragoza, built a narco-empire with a presence in 58 countries in Latin America, Europe, Asia and Africa, according to Buscaglia and other experts. Its transnational links provide the organisation with supplies for manufacturing drugs, arms-buying and money-laundering facilities, and the means to create production, storage and distribution centres. Guzmán’s re-arrest “was foreseeable, because (drug bosses) become targets to show that the rule of law exists in Mexico,” said Javier Oliva, an expert on national security and chair of a department at the National Autonomous University of Mexico’s Faculty of Political Sciences. Under former president Felipe Calderón (2006-2012) “there were rivalries in the cabinet. Now cohesiveness is much greater and there is (policy) continuity, because the armed forces are still on the front lines of the drug war,” Oliva said. When President Enrique Peña Nieto, of the traditional Institutional Revolutionary Party (PRI) took office in December 2012, he promised a new approach to security, to distance himself from the legacy of Calderón, whose war on drugs left over 100,000 dead. The difference has been one of nuances only, because Peña Nieto has kept the military in the forefront of the war against the cartels and the hunt for their leaders. In July 2013, government forces apprehended Miguel Ángel Treviño “El Z-40”, one of the leaders of Los Zetas, a cartel founded in the early 2000s by former members of Mexican army special forces. Violence abated a little. In 2013 a total of 34,648 homicides were reported, according to Mexico’s National System of Public Security, compared to 38,052 violent deaths in 2012. Guzmán may be extradited to the United States, in order to avoid scandals such as his escape in 2001. The U.S. government offered five million dollars for his capture and he faces charges there for drug trafficking and money laundering. Guzmán was apprehended only two days after the North American Leaders’ Summit, known as the “Three Amigos Summit,” between Prime Minister Stephen Harper of Canada, U.S. President Barack Obama and Peña Nieto in the Mexican city of Toluca, marking the 20th anniversary of the North American Free Trade Agreement (NAFTA). “When the authoritarian state was dismantled, it created a vacuum in state power. This meant that organised crime acquired more power. Mexican criminal groups benefited from those vacuums,” Buscaglia said. In his view, the main challenge is to regulate drug production and eliminate incentives for the manufacture of narcotics, in an unbalanced situation: the over-regulated U.S. market, and the poorly regulated Mexican one. “The solution is better regulation of the markets. If you remove the opportunity to make money, you eliminate the influence of the criminal groups,” he said, advocating decriminalisation of substances like marijuana. Since the military war on drugs was launched in 2006, the armed forces have killed several drug trafficking leaders: Arturo Beltrán Leyva, in 2009, Ignacio Coronel, a person close to Guzmán, in 2010, and Antonio Cárdenas Guillén of the Gulf cartel, also in 2010. Guzmán appeared on the U.S. Forbes magazine’s list of billionaires between 2009 and 2012, with a net worth of about three billion dollars. The web site Historias del Narco (Drug Stories) speculates that Dámaso López Jr., nicknamed “El Mini Lic,” who is Guzmán’s godson, might take his place. Born in Sinaloa, and regarded by the U.S. Department of Justice as Guzmán’s “right hand,” he heads a youth gang known on social networks as “Los Ántrax”. After Guzmán’s arrest, Phil Jordan, a former intelligence director for the DEA in El Paso, Texas, on the border between the U.S. and Mexico, expressed surprise, because according to him Guzmán had financed Peña Nieto’s election campaign. The statement he made on the U.S. Univision television network implicated the DEA as having knowledge of alleged links between organised crime and leading Mexican politicians. The contributions “are documented for past campaigns of the PRI. El Chapo, (Rafael) Caro (Quintero, of the disbanded Guadalajara cartel), all of them gave money to whoever was running for president. I don’t have the papers but there are intelligence reports which indicate that El Chapo’s cartel was very involved in politics,” he said. Why, then, did the government of Peña Nieto arrest him? “Something bad happened between the PRI and El Chapo Guzmán,” he speculated. And he did not rule out that the drug trafficker may have negotiated his capture. Neither government has yet responded officially to Jordan’s statements. The problem is the demand for drugs. All this planning and scheming does nothing but destroy society from within. It is happening to ours too, it’s just a little more distant. The solution is to decriminalize all drug use in the US. People need help, we can either give it to them or they can elect to die from their decease. It’s just like cancer or anything else. By criminalizing drug use we negate treatment for them and so they become the pariahs, we fear. By forcing them to buy in the black market we empower the drug cartels and the criminals in society. We know this, the 18th and 21st amendment prove this. The American public does not necessarily support this criminal policies. I hate to turn conspiratorial, but why else would we have this policy? It is the last desperate bites from the rabid need to control the Americas by the dying Truman Doctrine.